This stunning beach-front villa is an ideal venue for weddings or events, with seven beautiful bedrooms and an extra children's room, there's plenty of space for everyone. 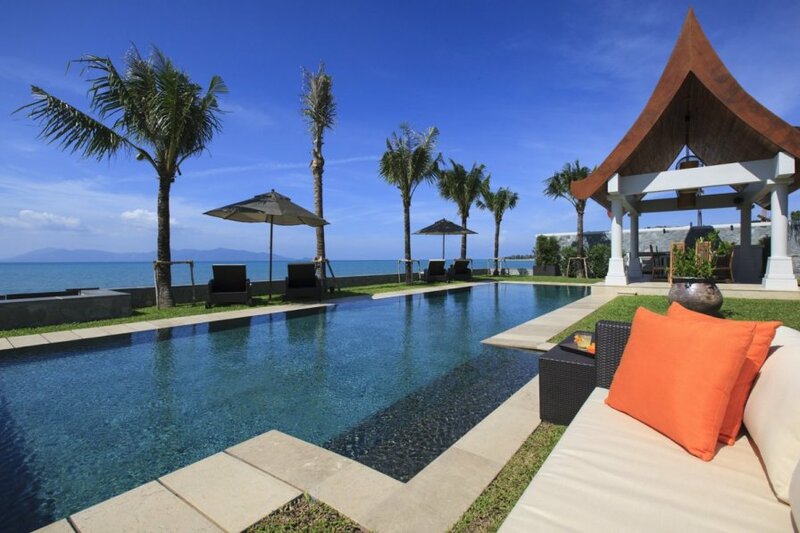 With direct access to Mae Nam beach, the jewel of Samui island is on your doorstep! Upon entering through the double timber doors, the serenity of the lotus pond leads you to an opulent entrance hall, and your luxurious stay begins. From here, the simple, elegant pairing of timber ceilings and teak floors creates a genuinely luxurious ambience in the indoor living area, complete with gorgeous sofas. At the far end of the living area, there is a fabulous Thai wood dining table for 14, a wall-mounted flat-screen TV and a sleek, fully-equipped kitchen available for your use. If you'd instead just put your feet up, our experienced on-site chef will be happy to meet your culinary desires. Indeed, throughout your stay a personal villa manager, chef and maid will ensure your comfort and wellbeing wishes are fulfilled. There are six main bedrooms, a master bedroom and a children's room. The master suite boasts glorious sea-views, with a private veranda overlooking the garden and even a connected private office space. Aside from the master suite, there are four double rooms with king-size beds and two twin rooms. All six enjoy a dressing room, sofas, TVs, fridges and breath-taking ensuite facilities. Soothing colour palettes of brown, ochre and gold allow the delicate ornaments and paintings to complete the traditional Thai ambience. All seven rooms benefit from the warmth and light of the beautiful outdoors flooding in via the wall-sized patio doors. The dedicated children's room consists of three sets of bunk beds, a large TV, Nintendo Wii console and beanbags. All eight ensuite bathrooms come equipped with 100% cotton bathrobes and slippers and a range of luxurious toiletries. The sparkling gem of the garden is undoubtedly the enormous pool, with beautiful underwater lights and plenty of sun loungers surrounding it, allowing you to catch some rays all day long! A traditional Thai Sala with Bluetooth speakers throughout and a large table for 14 provides the perfect spot for an alfresco meal with the whole group. Meanwhile, the veranda attached to the main villa with comfortable sofas and chairs around a coffee table offers more relaxed seating options. If ever you desire a change of scenery, just a short stroll will take you to the beautiful Mae Nam village. Villa Kannika is a modern 7-room beachfront villa which can accommodate 14 adults. It has an extra games room with three double bunk beds allowing to accommodate 6 children additional to the 14 adults. Villa Kannika is located on the tranquil Mae Nam beach, a five-kilometre stretch of palm-lined, pristine white sand famous for its glorious sunsets.